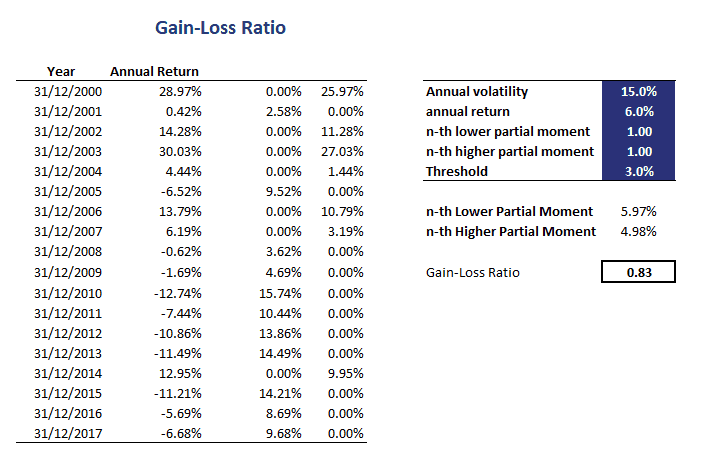 On this page, we discuss the gain-loss ratio formula, interpret the ratio, and finally implement the Gain-Loss Ratio in Excel. To implement the ratio in practice, we make use of the first-order Lower Partial Moment. The GLR divides the first-order higher partial moment of an investment’s returns by the first-order lower partial moment of the portfolio returns. Thus, we need to calculate the first Lower Partial Moment (LPM) and first (HPM) and divide the latter by the former for a given threshold return tau. where we set tau equal to zero. Thus, all we need to do is calculate the 1st Higher Partial Moment and the 1st Lower Partial Moment. When expressed in terms of Partial Moments, it is pretty easy to calculate the GLR provided we can estimate the Partial moments. Fortunately, it is straightforward to calculate LPM and HPM using an Excel spreadsheet. The Excel spreadsheet at the bottom of this page implements the GLR. We discussed the Gain-Loss ratio, which is the ratio of the expected return of positive returns divided by the expected return of negative returns. It is a measure of downside risk similar to the Sortino and Omega ratio and a good alternative to using the Sharpe Ratio.